If they have no or very low production of growth hormone (growth hormone deficiency). If they have Turner syndrome (a genetic problem which may affect growth). If they have reduced kidney function. In adults Norditropin NordiFlex is used to replace growth hormone if their growth hormone production has been decreased since childhood or has been lost in adulthood because of a tumour, treatment of a tumour, or a disease that affects the gland which produces growth hormone. If you have been treated for growth hormone deficiency during childhood, you will be retested after completion of growth. If growth hormone deficiency is confirmed, you should continue treatment. The dose for children depends on their body weight and body surface area. Later in life, the dose depends on your height, weight, gender, and growth hormone sensitivity and will be adjusted until you are on the right dose. The usual dose is 0.025 to 0.035 mg per kg body weight per day or 0.7 to 1.0 mg per m2 body surface area per day. The usual dose is 0.045 to 0.067 mg per kg body weight per day or 1.3 to 2.0 mg per m2 body surface area per day. The usual dose is 0.050 mg per kg body weight per day or 1.4 mg per m² body surface area per day. The usual dose is 0.035 mg per kg body weight per day or 1.0 mg per m2 body surface area per day until final height is reached. (In clinical trials of short children born SGA doses of 0.033 and 0.067 mg per kg body weight per day have typically been used). If your growth hormone deficiency continues after completion of growth, treatment should be continued. The usual starting dose is 0.2 to 0.5 mg per day. Dose will be adjusted until you are on the right dose. If your growth hormone deficiency starts during adult life, the usual starting dose is 0.1 to 0.3 mg per day. Your doctor will increase this dose each month until you are getting the dose you need. The usual maximum dose is 1.0 mg per day. Rash; wheezing; swollen eyelids, face or lips; complete collapse. Any of these may be signs of allergic reactions. Headache, eyesight problems, feeling sick (nausea) and being sick (vomiting). These may be signs of raised pressure in the brain. Serum thyroxin levels may decrease. If you get any of these effects, see a doctor as soon as possible. 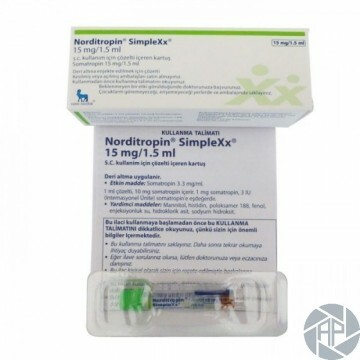 Stop using Norditropin NordiFlex until your doctor says you can continue treatment. Formation of antibodies directed against somatropin has been rarely observed during Norditropin therapy. Cases of leukaemia and relapse of brain tumours have also been reported in patients treated with somatropin (the active ingredient in Norditropin NordiFlex), although there is no evidence that somatropin was responsible. Redness, itching and pain in the area of injection. In rare cases, children using Norditropin NordiFlex have experienced hip and knee pain or have started limping. These symptoms may be caused by a disease affecting the top of the thigh bone (Legg-Calvé disease) or because the end of the bone has slipped from the cartilage (slipped capital femoral epiphysis) and may not be due to Norditropin NordiFlex. A clinical trial in children with Turner syndrome has shown that high doses of Norditropin can possibly increase the risk of getting ear infections. Feeling of skin crawling (formication) and numbness or pain mainly in fingers. Carpal tunnel syndrome; tingling and pain in fingers and hands. Itching (can be intense) and pain in the area of injection.